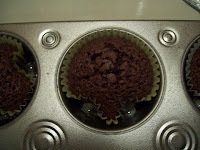 After making my heart shaped cupcakes using standard pans, I was given the idea to use more marbles to achieve other shapes. So I made shamrocks and mushrooms. Shamrocks take four marbles (with two spaced closer together for the stem) while mushrooms take two marbles which form the stem. 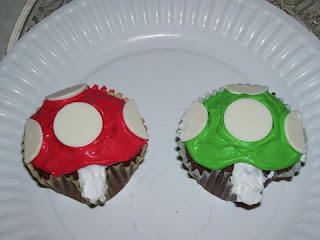 My daughter thought that the mushrooms should become "Mario Mushrooms" so I decorated them accordingly. I have to admit, the mushrooms were, initially, a mistake. I missed putting in the extra two marbles in a few of the sections. 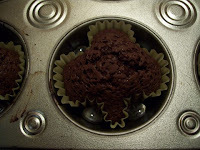 Use the same frosting technique that you did to make your hearts look pointed, and those mushrooms become spades. 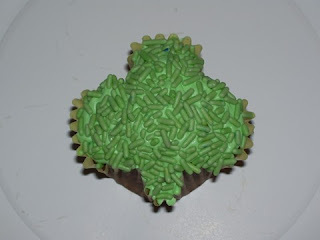 Call the shamrocks clubs, and you're three-quarters of the way to theme cupcakes for a bridge club or casino night. All you need now is a way to make diamonds.